Eleanor’s room is done! She’s a fan. 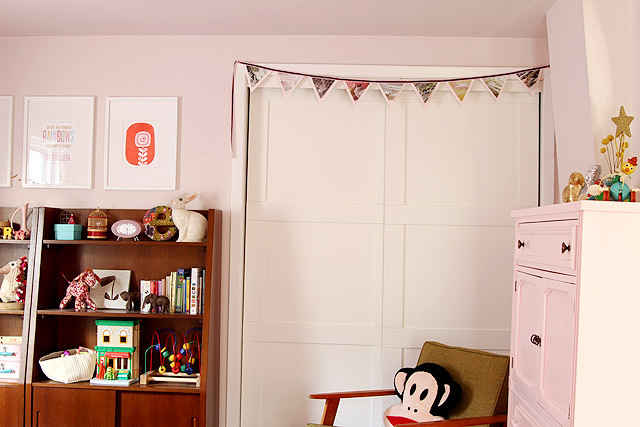 The pink walls, lighting fixture, and curtains that I made are still in the room from when it used to be my studio. There is a detailed list of sources on a separate page, so do take a look if you’d like to know where something specific came from. 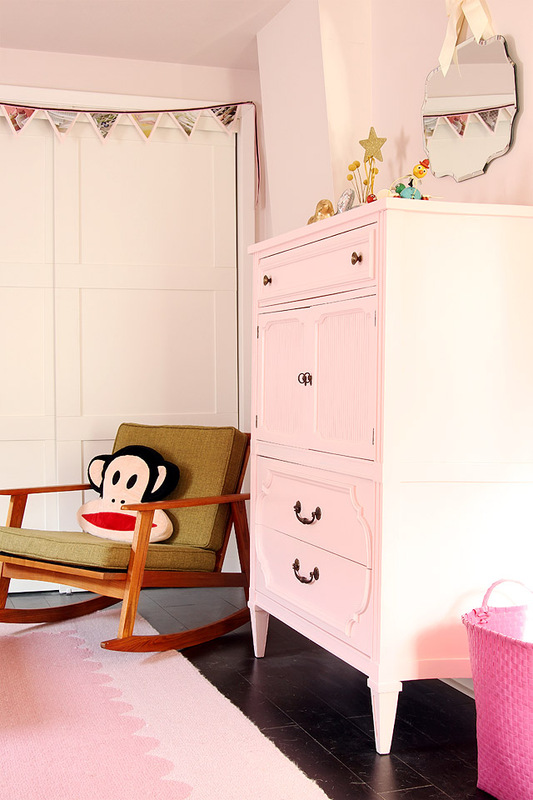 Here’s the vintage dresser from her nursery that we painted pink. I hung a mirror (it’s named the Eleanor Mirror!) above to reflect light from the window on the opposite wall, and the basket on the floor is for Eleanor’s laundry. To the left of the dresser is a rocking chair and her closet. To the left of that are her bookshelves. She loves grabbing toys from them. There are three framed prints above the bookshelves. I made the Que Sera, Sera print in the middle (download it for free here! ), and the other two are by The Black Apple and Lulu Dee. The frames are from Target. Download this print for free! 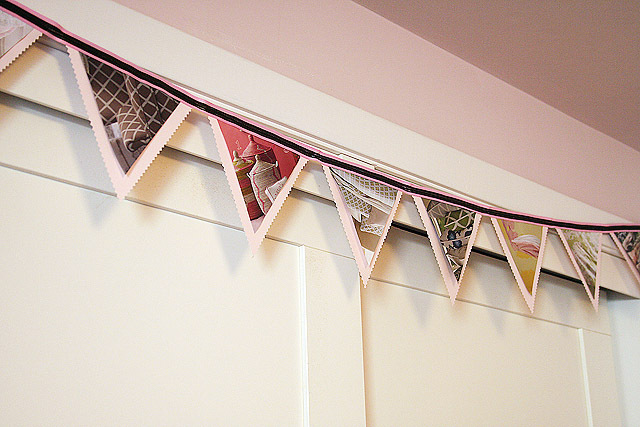 I also made the recycled paper banner that hangs above her closet. There are more toys on the other side of the room, behind the door. The smaller things are in toy boxes, and the larger toys are tucked away in a little alcove. The girl loves to read. I wouldn’t mind living in this room! What a lucky little gal. I love my son’s nursery, but seeing this makes me very excited to one day give him a big boy room that he can play and read books in! And I see one of my favorite Little Golden Books on the nightstand: the Poky Little Puppy! Did you install the closet doors? Are they sliders? If so, where did they come from? Yes, Brandon and I put those in. They were from Home Depot. Lovely, lovely, lovely. Need I say more? Nice work there and I like the right amount of girly sweet appeal without being too over the top. yay! I’ve been waiting to see her room complete! 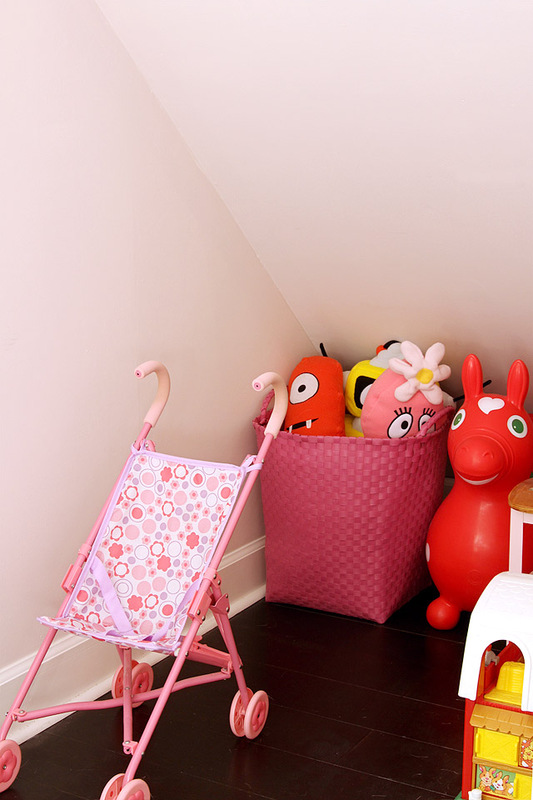 I love the farmed art and really love the Gabba characters peeking out of the pink basket. What a cutie she is! I love the room! SO fun to see it finished. I wish we had that many places for toys over here. I need an alcove for sure! Lucky girl with a great mama! Good job! I love your closet doors. I definitely need to spice up my rolling doors and this is just the solution. 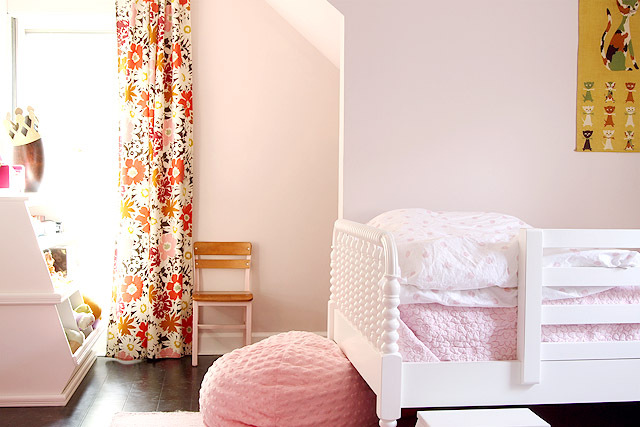 The soft pink with the vintage vibe makes for a remarkable lil girls room. After seeing her room, I can’t wait to see August’s room! Hopefully next week! I just need to find some time to get some sewing done. Love it…perfect mix of pretty and fun. Where did you get the laundry basket and the small yo gabba yabba figurines? Love the closet doors too! Brandon bought them on Amazon. I think these are the ones we have (though I didn’t realize they were so expensive for little plastic figures). Oooh, Eleanor has Rody the horse! What do you think of it? I’ve had it on a wishlist for a while. Love that she’s a book worm! She’s not all that into it right now. I think it’s so cute, and she has a lot of fun on it, but her love for it seems to come and go. Love Eleanor’s t-shirt. Where is it from? Where is the book end from that says “The End”?????? MUST HAVE!!!! CB2. I wrote about it on Babble not too long ago. Absolutely darling and so real, kid friendly and approachable, love it! I love how you’ve added your signature style to this room, but it’s still clearly a child’s space. Everything is nice & neat, yet the room feels like a place she can play. Well done! Very nicely done! So cute and so girly! Where did you get those alphabet train letters? I would like to find some for my son. We got those from a local toy store, Geppetto’s Toy Box. Lovely! What happened to the marimekko paper you were going to use? It was a vintage wallpaper, not Marimekko. I decided that I really liked the curtains in the room, and the pattern didn’t work with the wallpaper. Maybe I’ll still do it someday down the line, but I’m not sure. That first photo says it all. 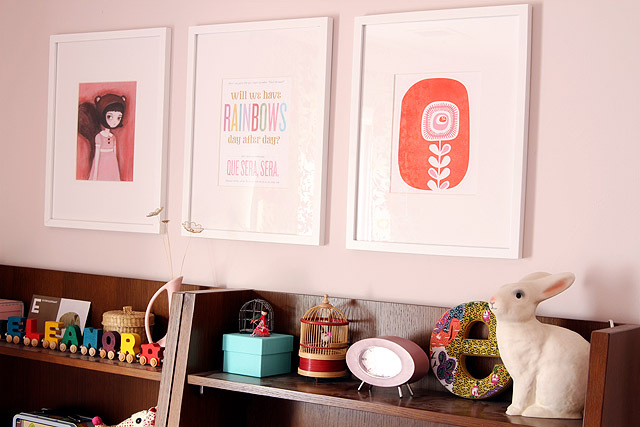 What a great room for Eleanor but also a great reflection of your style – pink does love brown! The white Jenny Lind bed was a perfect choice for the room. I guess this means a studio tour is up next? Can’t wait! Pink totally loves brown. August’s nursery will be up next… then eventually it’s on to the studio! She is tooooo cute!! And the room, fabulous. My neice is having her first baby (a boy!) in October, and I’ve shared the monthly photo idea with her. She thought it was brilliant. Thanks for all of your inspiration. Also, love her haircut!!! Such a big girl now…. It looks like it has a face, doesn’t it? Oh, my God! I’ve been following your blog for quite some time (since you were pregnant actually) and now I am impressed of how much Eleanor has grown! Wow! How time flies! You’ve done a great job with her room. I especially like the “dresser corner”, so cute! and these flower hangers on the wall…ADORABLE! such a dream room :) you did a fabulous job with the furnishings and details (esp. loved the last image to end the tour). and the alcove would make a nice reading nook, too. That alcove is great. Right now it’s a good place to put big toys, but I can see us making it into a little hideaway or reading nook in the future. wow – so so fun, eleanor must be so happy! 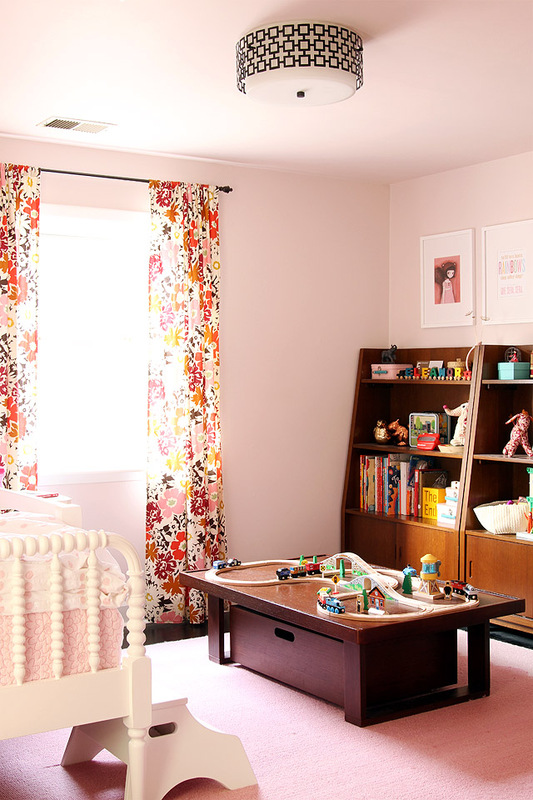 Such a “neat” and cute little girl’s room! We still have shelves and craft supplies in the closet! I’ll be working on getting those down to the studio soon, so I can write about Eleanor’s closet after that. wow. THIS is my Favorite room in your house now! I absolutely love how it turned out! it has great personality, beautiful vintage quality to it and the toys are all to DIE. LOVE IT. Fantastic! I love everything about it! It looks like she loves it! I know I do!!! Of all the home blog designers I frequent you are my favorite. You never disappoint, and always add that extra something that makes the room so fun. I am glad Eleanor loves her new room. Beautiful room!, you did a very good job : ) . 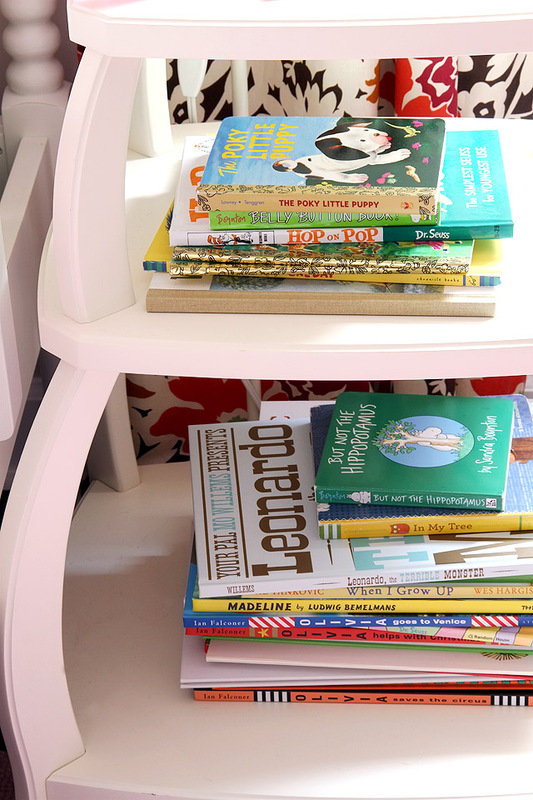 Do you mind sharing where you found that yeloow “The End” bookend? Hi from Venezuela Nicole! 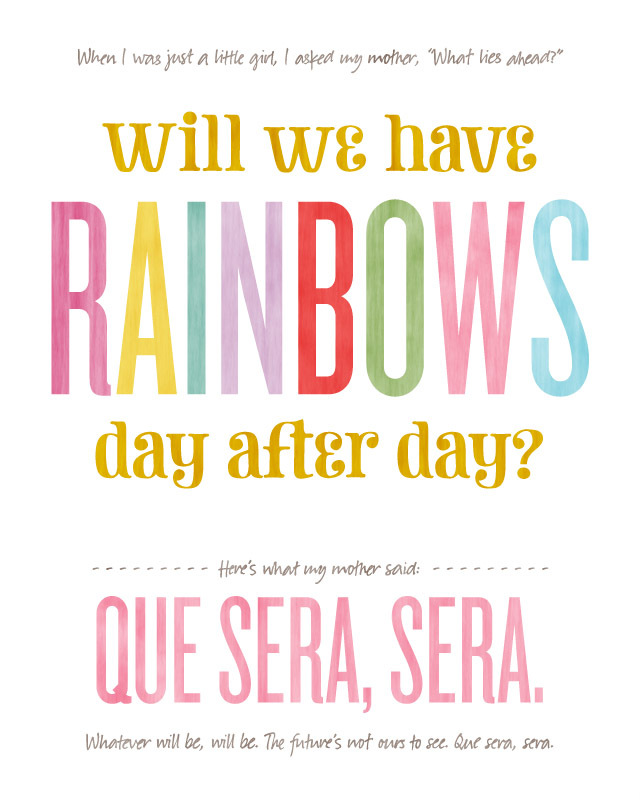 Because you seem to really like that “que sera, sera” poster i just want you to know that the correct frase (in correct spanish hehe) would be “lo que será, será” but, despite that, it’s really cute! By the way, congrats on your beautiful family! :0) i’ve followed your blog for about 3 years now and it has been really cool to see it grow from a 2 to a 4 members one! Those painted toenails! Be still my heart. Very pretty in pink! I love that you painted the ceiling, it makes such a difference in the feel of a room. The Eleanor mirror is a great touch! So sweet and adorable! I can see why she loves it! And I absolutely love the pic of Eleanor holding up the viewfinder. 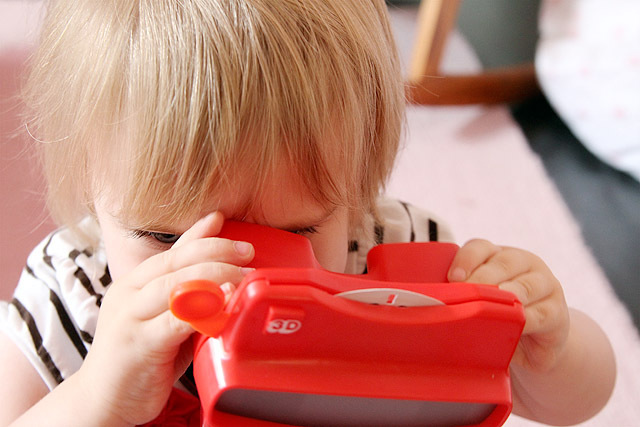 Reminds me of my prized viewfinder ‘pics’ – an episode of Happy Days and one from Scooby Do! BIG GIRL ROOM!! so beautiful. 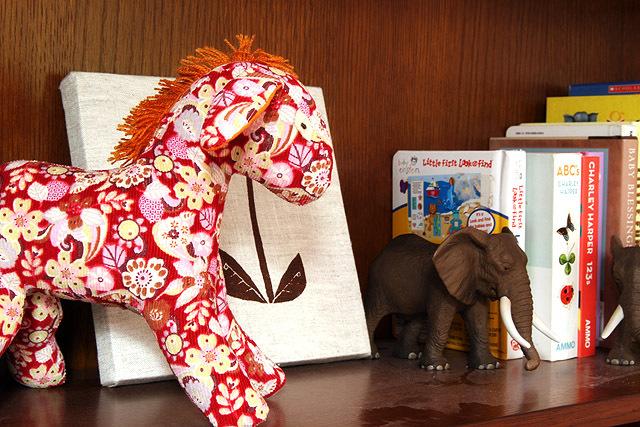 Where did that adorable stuffed horse come from? BTW, I want to thank you for keeping a tiny bit of dust in your picture. Makes me feel a tiny bit better about my house! ha ha. Much too darling!!! Love everything about Eleanor’s room :) And I’ve got the same Black Apple print in my studio! I’m in love with that CB2 bookend. Such a shame they aren’t in Australia and their shipping prices are absolutely insane. :( You guys have so much choice and variety over there! I’m very jealous. Absolutely gorgeous room as always! I can’t wait to see the finished nursery now. That first photo is gorgeous, Eleanor gets prettier by the day. Very, very cute! Adopt me so I can live there? Adorable! I love that there is style without it being overstyled. Nothing worse than seeing ultra styled rooms for kids that dont look like the little one would enjoy being in it. This room looks like fun will be had! Wow, this is such an amazing little girl bedroom! I love it all! I imagine she has sweet dreams in her sweet room! Once again I got to say I love the books she has in her room! My daughter loves Olivia and Madeline too! Have to ask – is the vintage Fisher Price Little People Sesame Street toy from a family’s toy box, or did you purchase it? So fun! You really did an amazing job! I just did Black Apple prints in m daughters room too! you make me want to start decorate my son’s although we still happily keep him sleeping in our room. just let you know I love your blog & daily check itu makes me happy :) hugs from Jakarta. Is it bad that I am jealous of her room… I have an older sister who is 1.5 years older than me and we always shared but we never had a beautiful room like this. I absolutely love the bookcases, I love the way all the furniture is not matchy matchy but coordinate so well. Im inspired…my son is a new teenager (just turned 13) and I am trying to come up with a plan for his room. I asked him what he wanted the space to look like or a wish list and all he came up with was a game chair or recliner. Really…so uninspiring lol. 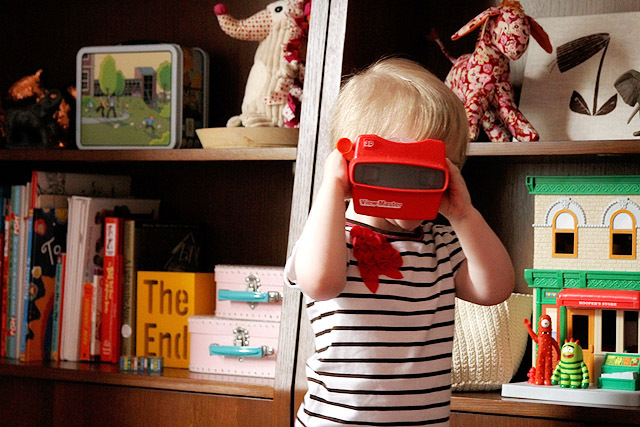 My jaw just dropped – The Poky Little Puppy was my absolute favourite book when I was a child! I hope Eleanor enjoys it. So cute! I noticed awhile back that you’re planning to put a play room into your basement. Once you have that up and running, will some of Eleanor’s toys move down there? Or will the playroom hold different types of toys and activities? I have a baby daughter and have been thinking about future toy organization. I have the space for a dedicated playroom, but am trying to figure out if we need one. wow! everything looks lovely – she’s one lucky girl! I absolutely LOVE this room. It’s perfect. It looks so beautiful! I think it is a nice combination of being kid friendly without being overly cutesy. She should grown into this room for years to come. My 2 year old daughter is still set up with her crib & baby stuff. This makes me want to redo her room right now! What a sweet room! I love the print too. Wow! It really looks great! The very soft pink is hardly noticeable and the room is so well balanced, nothing too girlish or overload-ish cute, you did a great job! You’ve done an astonishing job. Its perfect. Every little detail is perfect! I love her new room! So lovely! I appreciate you sharing these with us. totally worth the wait…she looks adorable on her big girl bed! i know she is super happy…does she sleep there without you guys having to intervene?? great job nicole! this room is just wonderful! Nicole I love your style!! and your daughter is cute as a button. I wish I could play with her. she looks mischievous with that little smirk. LOVE!!! love the room!!! where did you get the train set? What a beautiful, special room! I love all of your personal touches. Eleanor is clearly a fan of her new room. I love that it’s such a reflection of what you project through your shop and blog – smart but lovely. It’s a girly pink room, but it’s not froufy or princessy in a stereotypical girlish way. Well done! I love it!!! It looks so cute but also completely functional! her smile in the 1st photo is waaay to cute!!! Aw! Love it!!! Beyond lovely in form & function. So cute, what a lucky little girl! 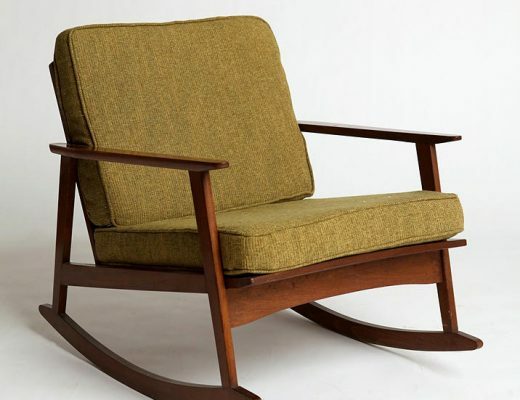 Though, I do wonder if it’s hard to get into the closet with the rocking chair right in front of it? Eleanor looks like she loves it! I love everything you did for her room. Wish mine looked like this when I was growing up. (Heck I would love my room to look like that now!) You knocked it out of the world, with every little detail. I also love that Polaroid toy. I used to have one! O WOW! Time flies! SHe is such a big girl now! With a room that is perfect for her cuteness. Bravo! Her bedroom looks awesome! And I love that shade of pink on the walls. Eleanor really does look like she loves it! Where did you find the hot pink baskets? I’d love them for our nursery! that is a lovely room…perfect in every way…Eleanor should be proud of her room…. I can’t find where it says where that beautiful fabric pony is from, could you share? It’s darling! Thanks. I love her room. She is a lucky girl for sure. And the “que sera, sera” poster, I got so glad by seeing my native language (portuguese) over there. There’s a song like that. It made me happy. Hi Eleonor! We are also a fan of your room :) Everything on it is perfect! 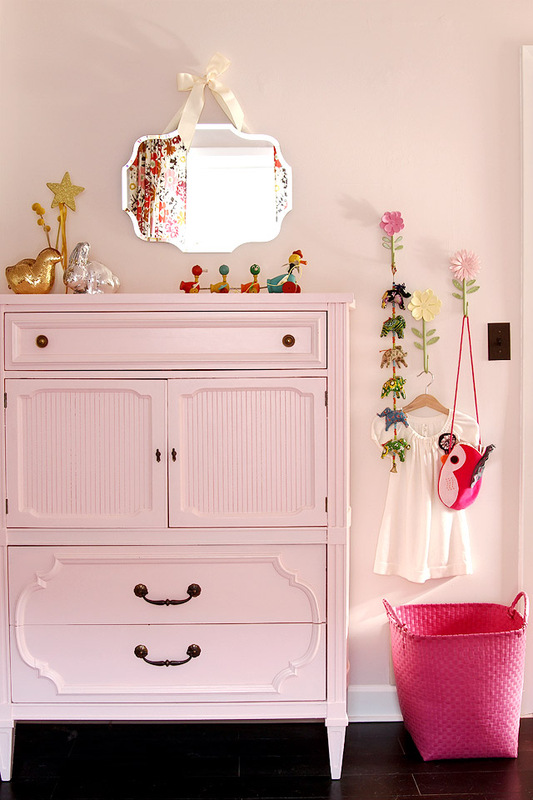 The mirror with cute ribbon, the mat, the light fixture, the pink cabinet… all beautiful! Love it Nicole! Eleanor really looks chuffed with it too – that first photo is brilliant! Smart storage is definitely the way forward! Well done for achieving such a great room! First time I post, but it worth a lot. It’s the prettiest bedroom I saw for a little girl. Congratulations! Ohhh please please tell me where you got the bed guard rail… been searching everywhere for one of those! You’ve really done a great job creating a room that will grow along with your daughter. 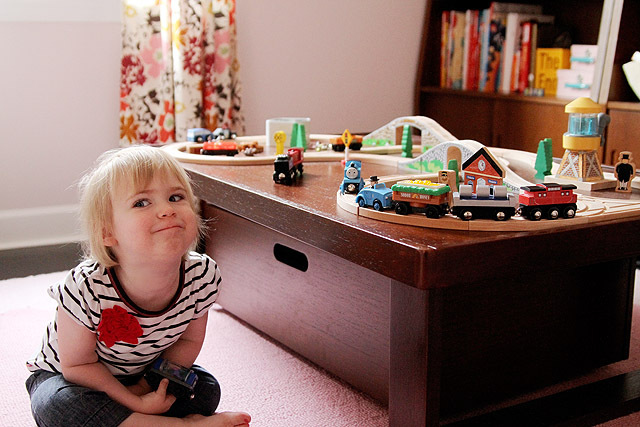 I wish we’d had the foresight to invest in high-quality furniture that will grow with our daughter, now 7. Besides her antique iron bed and a solid wood desk, our daughter’s furniture is pretty disposable. 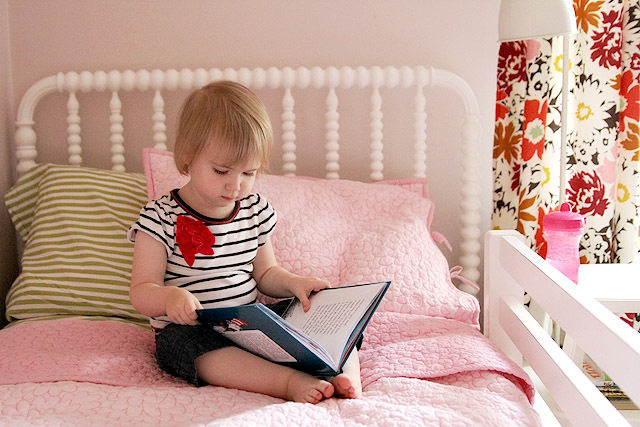 Your furniture and fixtures are all timeless and will appeal to your daughter for many years. Eleanor is one lucky girl! What a beautiful room. Stunning room. That’s one lucky little girl. 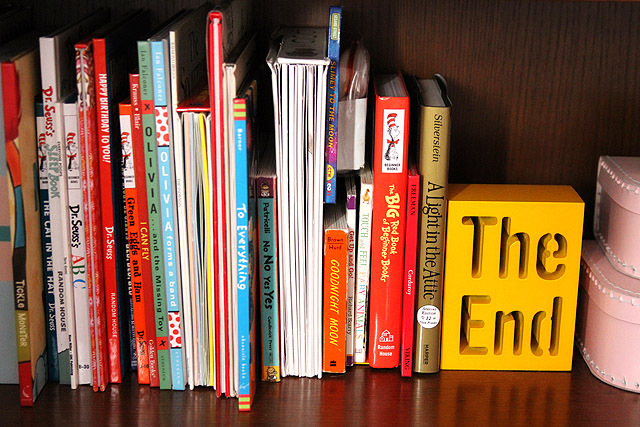 The “the end” bookend is perhaps the cutest thing I ever saw. Beautiful job, Nicole! She’s one lucky girl. What are the pretty sparkly animals on the dresser? LOVE IT! Those bookcases are sensational! And I love “The End” Almost bought it myself. Now I just might have to! where did you get your light fixture? this room is beautiful! I love everything about it!! Great room! I was wondering where you got the alphabet train letters? I’d love to get some for my son. This room is very sweet. Curious on the where from on the bean bag soft cover and her stool next to her bed to help enter. Also, still curious on the items from your son’s post too. You did a wonderful job, she must love playing in her room!